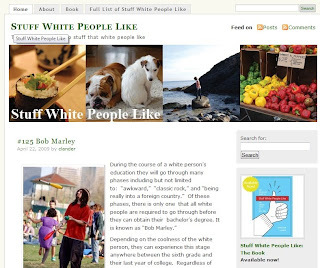 Love this site (http://stuffwhitepeoplelike.com/) and oh oh, they’re oh so right. Just a couple of examples…. Funny or Ironic Tattoos, Taking a year off, America, Facebook, Being offended, Rugby, Hating people who wear Ad Hardy, Having Gay friends, T-shirts, Grammer, Coffee, Barack Obama, Diversity, Religion’s their parents don’t belong to, Wine, Architecture, Sushi, Dogs, Vintage….